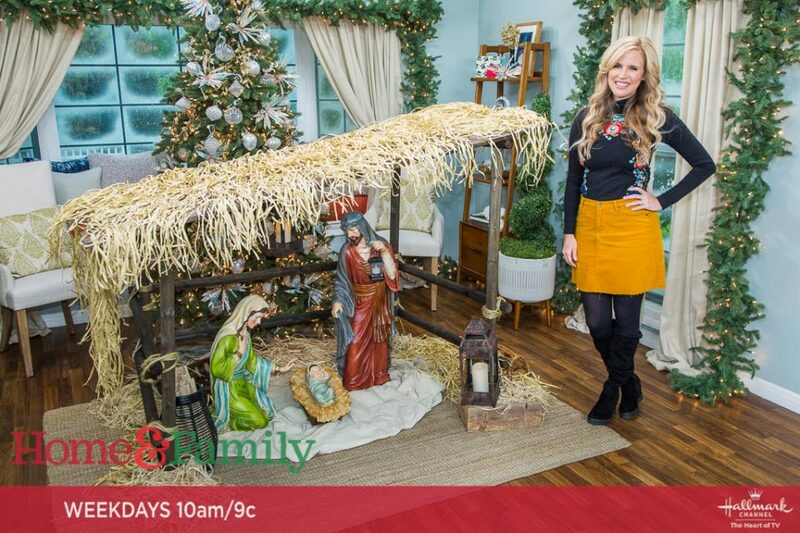 Getting you in the Holiday spirit I have the perfect DIY Nativity Scene for you to create. Here is how to get started! 1. Mark 2 40” poles at 9” and 20” from the bottom. 2. Mark 2 50” poles at 9” and 20” from the bottom. 3. Mark 6 40” poles 2” in on both ends. 4. Lay down 2 40” poles vertically and lay across 2 40” poles horizontally at the marks. 5. Pre-drill holes at the marks, and then drill in screws. 6. Repeat steps 4 & 5 with 2 50” poles and 2 40” poles. 7. Add 40” pole horizontally across top of both sides. 9. Stand both sides approximately 54” apart and lay across 2 58” poles where the 40” poles stick out on both sides and rest them on top. 11. Lay the 4 66” 1×10 boards staggered across the top and repeat step 5. 12. Stain or paint whatever color desired. 13. Tie rope where the horizontal posts connect with the vertical posts for a total of 8. 14. Lay grass skirts across the roof. 15. Add raffia at the base. 16. Hang and place lanterns and baskets inside. OPTIONAL: Add puck lights underneath the roof to light it up at night from above. *NOTE: Adjust size depending on the size of your figurines.